The Half-Whittler knives created by Ron Yellowhorse offer the most striking patterns, using such rare materials as slabs cut from fossil mammoth teeth to accent inlays of nickel silver. Other inlay choices include semi-precious stones including turquoise, jet, and suglite. The Seahorse Whittler knives may look simpler but offer detail in the style of David Yellowhorse. Many include complex inlays of antique bone and fine scrollwork on bolsters and chevrons. 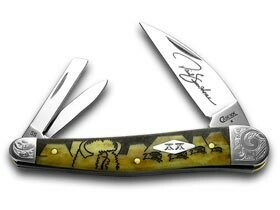 Some versions include handmade or hand-hammered blades, while others feature polished stainless steel whittler knife blades with the etched signature of David Yellowhorse on the main blade. Half-Whittler knives are only 3-1/4 inches long when folded with one large clip point blade and one penknife blade. The larger Seahorse Whittlers carry three blades. The main blade of the 4-inch-long Seahorse Whittler is a straight-edged Wharncliff blade with two smaller blades in penknife and coping patterns pivoting from the rear bolster. Knife collectors will certainly find something of interest in this wide selection of unique or limited edition knives. Price varies considerably, but all the knives are very well made. Whether an individual knife came from a series of ten or a series or 500, it's still a work of art. See the Bob Loveless Beretta Skinner for a good limited edition fixed blade.